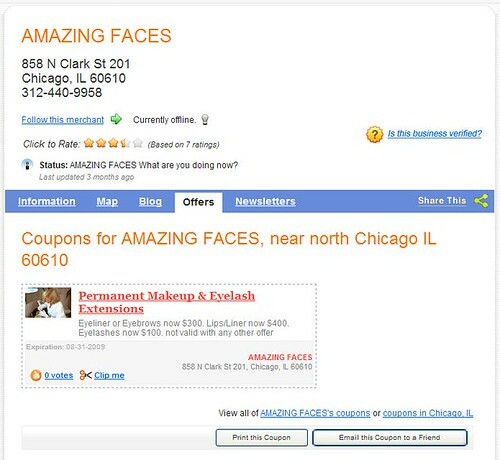 If you haven't already built coupons for your MerchantCircle listing, or haven't done it lately, now is the time! 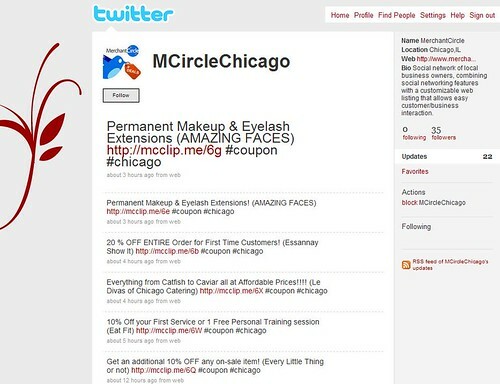 MerchantCircle releases the first-ever local city coupon feed via Twitter. Coupons that you feed will now automatically be fed to a city-specific Twitter page - making it easy for customers in your area to track real-time deals. Local MerchantCircle coupons are available today at: @MCircleNY, MCircleLA, MCircleChicago, MCirclePhilly, MCircleDallas, MCircleSF, MCircleOakland, MCircleSanJose, MCircleBoston, MCircleAtlanta, MCircleDC, MCircleHouston, MCircleDetroit, MCirclePhoenix, MCircleTampa, MCMinneapolis, MCircleMiami, MCircleDenver, MCircleOrlando, MCSacramento, MCircleStLouis, MCirclePortland, MCCharlotte, MCIndianapolis, amongst other cities. Clicking on the link from the city Twitter page will take consumers to your coupons listed on MerchantCircle. From there, they can print the coupon or save it to their Neighbors Profile (similar to clipping it and putting it on their refridgerator for later use). Consumers can create their Neighbors Profile here. MerchantCircle members currently create more than 50,000 coupons and deals a month and can easily be found by searching under "#coupon" or "#coupons" on Twitter. Real-time coupons are here! Start getting new customer today! This is a real use of social networking site. Publishing coupons on a site like twitter where thousands of people can see them. It will let the people save their bucks and increase sales as well.